We are located in the Stavlas Center at 8111 Fort Smallwood Rd. Pasadena Seafood is in the same shopping center that contains Pit Stop Pub, Cigarette Depot and more. See below for directions. Large wild caught shrimp cooked perfectly! 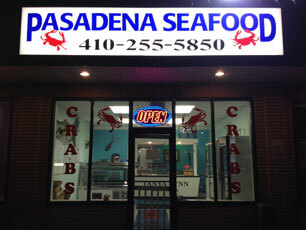 Pasadena Seafood is owned by a working Maryland Waterman who has been providing Maryland crabs to the Pasadena area for over 15 years. With our catch coming straight from the dock to you (about 1 mile from the dock to the store) we are able to offer seafood to you fresh and affordable.